Editorial cartoonist Jeff Danziger withdrew and apologized for an unflattering caricature of White House press secretary Sarah Sanders. 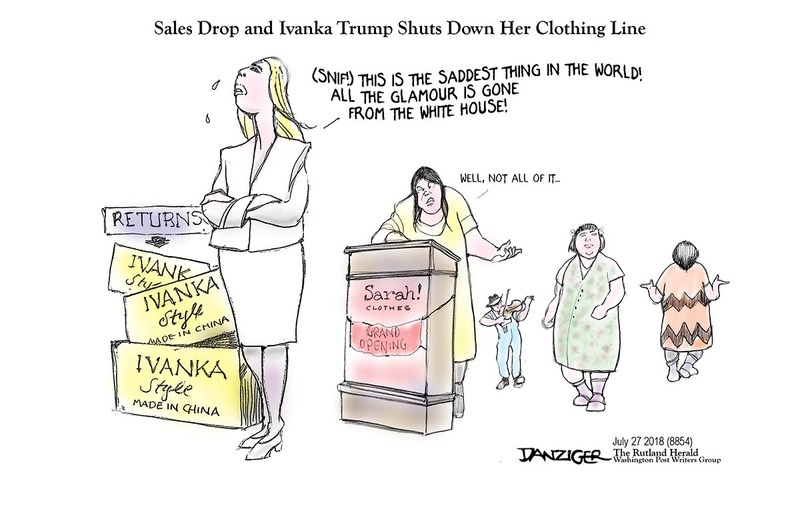 Jeff replaced the cartoon with a different take on the Ivanka clothing line troubles. Jon Levine reports at MSN. By the end of 2017 David and the L. A. Times had ended their relationship. Does somebody expect us to draw Sanders as a svelte beauty? Heck, Danziger’s caricature barely exaggerates her appearance at all. I patiently await the apologies for right-wing cartoonists’ caricatures of Hillary Clinton, Nancy Pelosi, and Michelle Obama. I would say the problem isn’t his depiction of her but the cartoon was simply a fat joke, nothing political, just an excuse to tell a fat joke. 23 queries in 0.119 seconds.